A lot of people already have asked us where to stay during Indie Pop Days. We picked out a few hostels that are more or less close to the club.. This hostel is just a 6 minutes walk away from the club, you can book everything from single rooms (55€) to 8 people-apartments (19€). The AO Hostel/Hotel is a big chain. 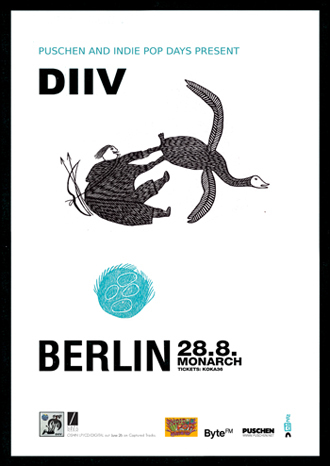 In Berlin they have hostels and hotels in different areas. The one in Köpenicker Str. which is only a 10 minutes walk far away from the club.. The Hotel is only a 8 minutes walk away from the club so a very good choice if you don't want to have a too long way to your bed after dancing the whole night. Prices are 70 € p.p./night, if you like to have breakfast you have to pay 10€ extra. If you don't get sea sick you should book a room in a swimming hostel. Oh no, it doesn't bring you to Club Marie Antoinette but it is a 25 minutes walk away. If you like to sleep in a former GDR-styled room then you should try this...also a bit far away to get to the club. But the hostel is located behind Ostbahnhof, so you can take the S-Bahn to Jannowitzbrücke and it is just one stop! Plus Hostel Berlin just opened in 2010 after the small chain opened a hostel in Prag and Florence. This hostel combines small budget accomodation with standard hotel facilities. It has an indoor swimming pool! You can book rooms with different standards here - hostel, hotel and Plus Girls rooms. The Plus Girls rooms provide all girls stuff like hair straighteners, big mirrors and a Wellness Pack Plus and they are of course ONLY for girls! If you have the Plus Loyalty Card you can get 10% off your stay on online booked rooms. The circus company offers a hotel and two hostels in this city. The standards are higher than at Hostel Xberger, which makes it (almost naturally) the more expensive choice. A bed in a 8/10 bed dorm without its bathroom starts from 19 Euro, including sheets, breakfast excluded. Another option is a double-bedroom for 70 Euro per night per room with bathroom and stuff. That makes it 35 Euro each and is a reasonable price for the third-ranked hostel by the users at tripadvisor. There are not much more new informations on lonelyplanet but see for yourself. Both hostels are in Mitte. Via public transport you will have to change trains once and it takes about 20 minutes to get there. This is yet another youth hostel and we believe the part with the youth is the word to be emphasised. It looks pretty poppy and youthy if you go past it with professional grafittis and stuff. Furthermore it is pretty 'far away' (about 5,6 km) and not too comfy to reach with public transportation, as we think. Prices are pretty high regarding the low budget traveling, because it's 2 Euro extra at weekends and 3 more Euro for linens and a towel... Well, that considered, the cheapest room is a 16 beddorm for 12 Euro a night. There are no informations about this place on lonely planet but on tripadvisor, and the feedback is a pretty wide mix. Wouldn't be our first choice. In case you are not able to crush at a friend's house but can't afford a hostel there are other options to stay in Berlin. If you have a tent anyway bring it and try the tentstation in Berlin Mitte. You can even rent tents if you don't own one or don't want to bring it. Prices are moderate. You pay 11 Euro per night as an adult. Breakfast is available but not included. For getting to the festival it is going to take you about 20 minutes with public transportation. It's around six kilometers away. Furthermore you might want to try couchsurfing if you feel comfortable with staying at houses of strangers (untill you get to know them), which would probably be the cheapest alternative and can in fact be lots of fun. Choose carefully who you would like to be your host for getting along well and remember that it's not a hostel, it's a stranger doing you a favor. 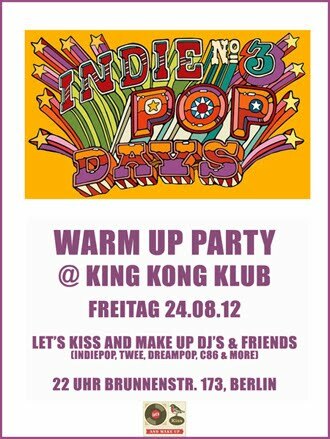 2012 präsentieren Euch Let's kiss and make up zum dritten Mal die Indie Pop Days - erstmalig im Club Marie Antoinette. 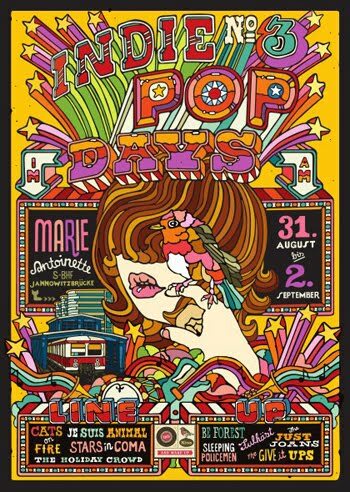 Let's kiss and make up present Indie Pop Days 2012 at club Marie Antoinette. Let's kiss and make up UG (haftungsbeschränkt) i. L.